NEW NITRAFLEX® PUMP™ is the scientifically complex power output formula designed to dramatically enhance muscle pumps while weight training. * Impressive, bigger and longer-lasting NITRAFLEX PUMPS! It’s Stim-Free, and won’t keep you awake after night training. Even those sensitive to stimulants can take it. Plus, it stacks well with other GAT products! No NITRAFLEX Pump Reviews Found. 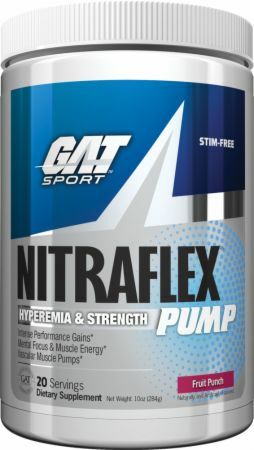 Directions For NITRAFLEX Pump: Mix 1 serving (2 Scoops) of NITRAFLEX PUMP with 10-12 fl oz of cold water and consume within 30 minutes before working out. Can take up to two servings daily. Warnings: This product is strictly intended for use by healthy persons 18 years of age or older. Do not use if you are pregnant, nursing or trying to become pregnant. Do not use if you are currently unaware of your health status or if you have a medical condition including but not limited to heart, liver, kidney, or thyroid disease, psychiatric or epileptic disorders, high or low blood pressure, cardiac arrhythmia, recurrent headaches, enlarged prostate or glaucoma. Do not use if you are taking prescription or non-prescription medication of any kind including but not limited to MAO inhibitors, anti-depressants, aspirin or non-steroidal anti-inflammatory drugs. Do not use if you are prone to overheating or dehydration. After 8 weeks of use, take 1 week off before resuming use. Discontinue at least 2 weeks prior to surgery or if you experience rapid heartbeat, dizziness, severe headache or shortness of breath. KEEP OUT OF THE REACH OF CHILDREN.